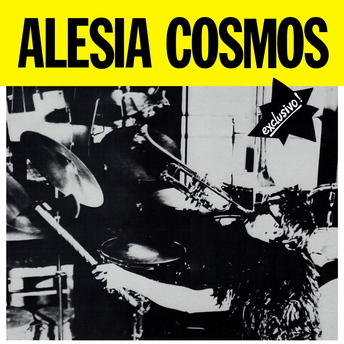 Alésia Cosmos was a collective of musicians led by Bruno de Chénerilles formed in the early 1980s in Strasbourg, France. The group consisted of Pascal Holtzer (guitar, synthesizer, tapes, drum machine, vocals), Pierre Clavreux (vocals, gong), Marie-Berthe Servier (vocals), Bruno (guitar, tapes, synthesizer, drum machine, vocals) and Tunisian percussionist Lotfi Ben Ayed (darbukas, bendir). In 1981 Bruno composed and wrote some sci-fi radio plays for French state radio channel France Culture. Under the influences of William Burroughs, John Cage, Pierre Henry and others, he developed tape music studio work. By 1982 he appeared for the first time under the name Alésia Cosmos Furi Show. It was a solo performance on guitar, voice, analog synth and tapes. This experimental show lead to a music project based on Bruno and Pascal's compositions to be performed and recorded with other musicians in the beginning of 1983. Exclusivo! was the group’s debut album recorded and self-released in 1983 on Planetarium. Pascal and Bruno would compose tunes in their personal home studios. Then they would bring the tapes, electronics, guitar lines and lyrics to experiment and rehearse with the other members of the group. Improvisations and adaptations brought more ideas and the album was recorded in a few days. The result was a musical mixing of electronic music, field recordings, North African and Asian percussion, electric guitars and voices, compositions and free improvisations. All four musicians take turns singing onomatopoeic phrases and backing vocals, even sometimes in an unknown language, a sort of mixed bag between Breton and Japanese. All songs have been remastered cut by George Horn at Fantasy Studios in Berkeley. Each LP is housed in a replica of the 1983 cover and includes a 6-page insert with photos, lyrics, reviews and liner notes by Bruno de Chénerilles.